Daily Spirit & Word: 797: Isn’t God Awesome? God’s Kind Of Kingdom Service. Yesterday was a dozy of a day. I got ready for the school visit to church, set-up the OHP ready for a powerpoint presentation on the miracles of Jesus. Only to find out after setting it all up that they were not going to show. Ahh Well, that was a good test-run 🙂 LOL. So I visited a lady in the parish who wanted a thanksgiving for her granddaughter. Then following a long conversation, in which she said, “I’ve been coming to that church longer than you”. Which made me smile inside because I’ve only met her once before. I’ve been at St Luke’s for just over eight years now. However, our conversation ended with one of the best Gospel encounters I’ve ever had. She was ripe and ready for the Good News. God’s timing or what? Please pray, because she wants me to share the Gospel with her daughter this morning. Yesterday reminds me that serving Lord Jesus is not always going to be easy or convenient, but it always turns out to be AWESOME. Mark 7:32 (NIV) “There some people brought to him (Jesus) a man who was deaf and could hardly talk, and they begged him to place his hand on the man. That verse today gives us some really helpful instruction about God’s Kind of Kingdom Service: Because you’ll notice in our text five things; Sweat, Sacrifice, Sympathy, Skill and Scout. SWEAT: “They brought.” The bringing of that deaf man couldn’t have been easy, it required some effort. “They” That indicates to me we are not always to work alone in God’s Kingdom. We need our brothers and sisters to help too. But bringing him to Jesus was not easy to do, but they did it. Service for God is not always an easy task, it might require some sweat at times. However, when you sweat in Kingdom Service there’s always, always God’s rewards; in this life and in the life to come. Praise the Lord for the privilege of sweating for Him. SACRIFICE: “They brought.” Kingdom Service often requires a price is paid by the servant. “They” had to give up their own time for this man. Time today is such a hard thing for busy people to find. It might not even be convenient, but it’s always time well spent if you are bringing someone to Jesus. The time and effort to get this deaf and dumb man to Jesus Christ, yielded a miracle for that man. You won’t really be serving very well if you are not willing to pay some kind of price and make a few sacrifices of time and effort and anything else that might be necessary in order to serve in Jesus Kingdom. SYMPATHY: “They brought that man to Jesus.” Those who brought the deaf and dumb man to Jesus that day had to have compassion for him. They must have known what life was like for that poor man, felt his agony, not being able to communicate. Any kind of Kingdom Service means we’ll soon begin to feel God’s Compassion for the needs of others. We all know that it was God’s compassion for us, his love and mercy that moved him to send Jesus to die. No one has ever had more sympathy or compassion for anyone than God, “for God so loved the world that He sent His One and Only Son” (John 3:16). So it shouldn’t surprise us that we’ve got to share in that same kind of sympathy and compassion for others to serve Him. SKILL: “They brought and begged.” Not everyone has the same skills, talents or abilities. We’ve all got different natural and spiritual gifts, so because we’re not the same, we’ll be able to use the skills that He’s given to us. Your Skill might not be that of an Evangelist, but in your service for Jesus you might simply be able to bring people to church to hear about Christ, letting someone else use their gifts and skills to bring them to faith. My friends, just because you’ve got different skills don’t despise them or get jealous of others. Just use the gifts and skills, passion and compassion He’s given to you. Each and every skill is required in building God’s Kingdom Family. SCOUT: However, even though you might have different skills, it’s important that you know where Jesus is and how to bring people to Him. Can you be a good Scout to lead people to Jesus? The deaf and dumb man was brought to Jesus Christ. Those people BEGGED Jesus to just touch the man. We can come to Jesus and beg Him to touch those we want to be saved by Jesus. Those Scouts did a good job that day, because only Jesus Christ could help the deaf and dumb man. Last night, whilst we were waiting for the Locksmith to come, we got chatting with a Cafe owner across the road. Although he was just closing up for the night, he allowed us to sit a wait, he also gave the crippled man some food. It was meant for him, but he had a tooth-ache. I asked if he believed in miracles to which he said he did. I asked, if I could pray. I placed my hand on the side of his face and asked Jesus to take away his toothache. I don’t know if he was cured instantly, but he shook my hand warmly a few times afterwards and helped me across the road with the man. There’s no one better for you to bring your friends and family. Even complete strangers need you to show Jesus kind of compassion. The Lord Jesus knows the best ways how to meet all their needs. Be a good Scout for Jesus and beg Him to come and touch your friends. You know my friends, this world will take people everywhere and to every kind of expert, sometimes they can help, but like last night, it’s ONLY Jesus who really knows what is best for them. Be like those people in Mark’s Gospel, who made a decision that day to take a deaf and dumb man to Jesus and begged Him to touch the man. He did, and he got his miracle. Do all you can to bring your friends to Jesus Christ: it might involve some; Sweat, Sacrifice, Sympathy, Skill and the ability to Scout out Jesus for them. However, the rewards of Kingdom Service are totally awesome. I’m sure we’re going to see so many fantastic miracles in that kind of Kingdom Service. Amen! Be blessed today, stay close to Jesus and be filled afresh with Holy Spirit for His Kingdom Service. Daily Spirit & Word: 769: Time With Jesus Every Day. 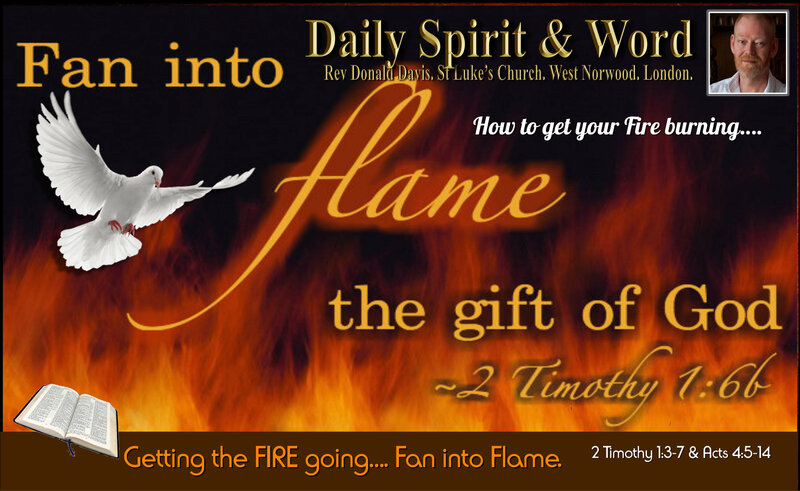 “FAN INTO FLAME THE GIFT OF GOD…” Timothy. “They Took Note: These Men Had Been With Jesus.” Peter and John. Good morning my friends, very soon I’m going to begin studying Paul’s Letters to Timothy. These are some of Paul’s warmest and yet most challenging letters in the New Testament. Timothy needed the Apostle’s tender encouragement, we do too. 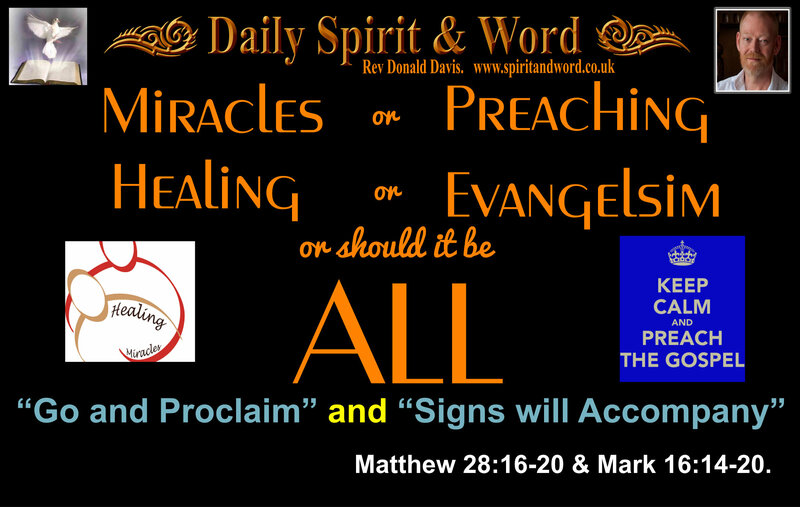 I’ll go through them systematically and you can follow them here at Daily Spirit & Word. However, let’s wet our appetites today with Paul’s encouragement to Timothy, and also Peter and John’s experience of having their GIFT fanned into flame. 3 I thank God, whom I serve, as my forefathers did, with a clear conscience, as night and day I constantly remember you in my prayers. 5 I have been reminded of your sincere faith, which first lived in your grandmother Lois and in your mother Eunice and, I am persuaded, now lives in you also. 6 For this reason I remind you to fan into flame the gift of God, which is in you through the laying on of my hands. That “Gift Of God” sometimes called “The Anointing”: is the passion, zeal and desire to serve the Lord Jesus Christ with your whole heart, soul, mind and strength in the power of the Holy Spirit. Each and every Christian needs ENCOURAGEMENT: Because this calling is a tough one, we need it to get our flickering flame glowing from a spark into a burning flame of light for Jesus. One of the things that keeps me on fire is being with Jesus in Daily Study of the Bible. It’s something I’ve been doing since I started following the LORD. Oh yes there have been times when I’ve stopped for a short while, but I can testify from sometimes bitter experience that I’ve been my weakest when I’m not with Jesus every day in His Word. Daily Bible Study: Is just ONE of the ways you can “Fan into Flame the Gift of God”. How? Because God’s Word FEEDS your soul and spirit. It moves you to praise, prayer and seeking the power of the Lord. You don’t have to read much of God’s Word to soon realise that you NEED His personal presence with you and in you every day. What is the gift you’ve been given? First and most important is the GIFT OF FAITH to believe in the LORD Jesus Christ for Salvation. 2) Bible Reading / Study. 3) Fellowship: Gathering in some way with God’s people every day. 4) Worship: Singing, Praising and giving thanks to the Lord. 5) Discipleship: Helping others to grow closer to Jesus with you. 6) Evangelism: This not only brings others into the Kingdom Family, but it also strengthens the faith and gifts that the LORD has given you. Philemon 1:6. 8) LOVE: When we’re filled with God’s Holy Spirit daily, we’ll be FULL of His LOVE… This will enable us to LOVE others. I try and incorporate these things into my life almost every single day, and in that way, the FLAME is ignited and kept burning brightly for Jesus. Whilst I know and acknowledge that this would be and is very difficult for most people, you have commitments; family, children, work. You have responsibilities; cleaning, caring, cooking. You have hobbies and need time to relax as well. Non-the-less, time spent with Jesus in one of these ways every day will transform your life. You will notice that suddenly you’ve actually got more free time, more energy, more self-control. You’ll notice that your desires will be changing and you’ll begin to love the opportunities that the LORD is bringing to you. So many people testify to the fact that they get the POWER from the LORD they’ve been looking for for ages, when they follow these simple steps and put into practice some of the teachings of Jesus every day. Here’s the verse the LORD put on my heart to share with you today. (NOTE it’s verse 13 from the passage below). Peter and John had healed a man and the commotion that followed led to them being arrested and thrown into prison. 5 The next day the rulers, elders and teachers of the law met in Jerusalem. 6 Annas the high priest was there, and so were Caiaphas, John, Alexander and the other men of the high priest’s family. 10 then know this, you and all the people of Israel: It is by the name of Jesus Christ of Nazareth, whom you crucified but whom God raised from the dead, that this man stands before you healed. 13 When they saw the courage of Peter and John and realised that they were unschooled, ordinary men, they were astonished and they took note that these men had been with Jesus. 14 But since they could see the man who had been healed standing there with them, there was nothing they could say. What do I get from this passage? When you are WITH JESUS EVERY DAY: You’ll soon see miracles happening all around you too. The miracles might seem small to start with, but they’ll encourage you and “FAN INTO FLAME THE GIFT OF FAITH GOD HAS GIVEN YOU”… even more. When you do things, good things, for Jesus; then it can lead to persecution. Jesus promised this would happen. It’s happening today my friends, to Christians all over the world. In England too; the other day in Bristol a man who was being abused by a large crowd when out preaching the Gospel and was arrested. He was exercising his freedom to speak publicly (something we can do legally here in the UK), but he was arrested instead of the ones abusing him. Don’t be surprised when persecution comes, but still; be gentle, be loving, be kind and compassionate, because it happened to Jesus as well. 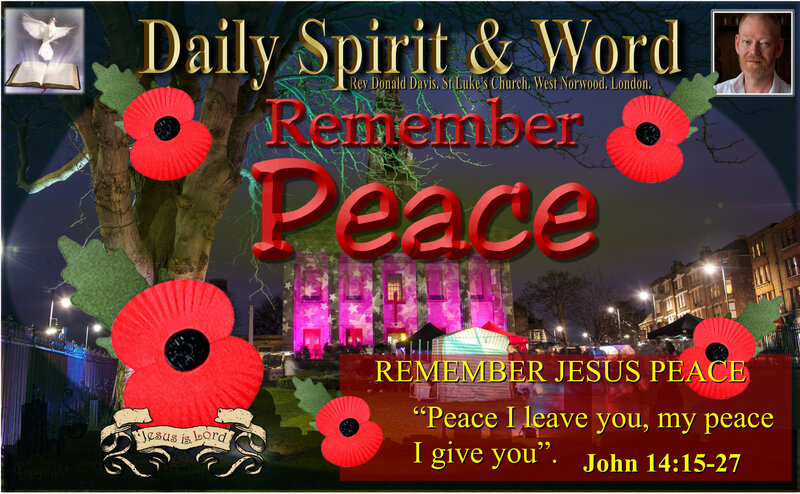 John Wesley was a Holy Spirit anointed and gifted preacher, thousands were moved to tears and repentance when he spoke, but his experience in Scotland (Accross the Tweed) needs special note. I’m going to study Timothy, because I see that he needed encouragement from the Apostle Paul to fan into flame the gift of God, I need that too. We all need encouragement my friends, and as I study Paul’s letters to Timothy I hope we will all be set-ablaze with God’s GLORIOUS GIFTS too. Perhaps as we draw close to Jesus this week, we’ll see awesome miracles like Peter and John did on the way to the temple to pray. Prayer: Dear Heavenly Father, as I draw close to Jesus every day this coming week, I pray that the gift of faith you’ve given me will become a burning fire. I want to serve you with zeal, love, devotion and power. Help me to make use of those things that will ignite my faith; prayer, praise, worship, Bible reading and study, fellowship, witnessing and love… I’m praying that You will be glorified with my life this week. Come afresh into my life in the power and presence of the Holy Spirit. Through Jesus Christ my Lord and Saviour I pray. Amen! Acts 4:13 When they saw the courage of Peter and John and realised that they were unschooled, ordinary men, they were astonished and they took note that these men had been with Jesus. They took note that Peter and John had been with Jesus, they were just ordinary men, they knew HOW to fan into flame the gift of God. By being with Jesus, so we can do the same things every day. 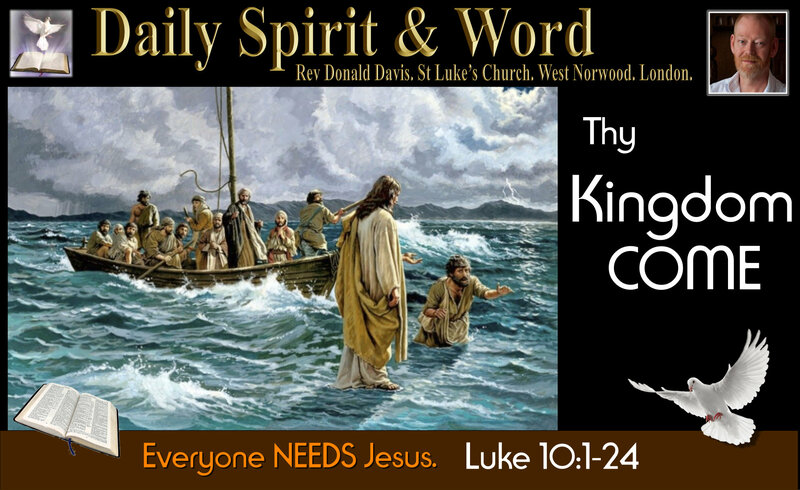 Daily Spirit & Word: 747: They ALL Need Jesus. Doing the IMPOSSIBLE with Jesus. Read to the End Today, there’s a funny story to encourage you. Good morning my friends, do you remember me telling you about Emma? She became a follower of Jesus last Tuesday, got baptised on Sunday and came out on the streets last night to share the Gospel with us. Emma admits she doesn’t know a lot, but is filled with the desire to lead others to Jesus to experience His promise of what she has received. When you get to Heaven Jesus is not going to ask if you attended church, worshipped regularly, prayed every day or read your Bible, He’s going to hold you to account for your obedience to His teachings. Emma doesn’t know much, but she knows enough to know that Jesus wants us to bring everyone to Him and last night, fearful, trembling and unsure, she began to really walk in that obedience. You should have seen her face when she came back, she was beaming. What was great about last night? There was a wonderful TEAM spirit, we split into twos and one group of three. Some went up-town, others went down-town. We’ve been praying slightly differently as I shared a few weeks ago. We’re not asking God to come with us, because we KNOW Jesus is with us, we just thank Him for His PROMISES that when we go in obedience to His Commands that He’ll be with us. We’re not asking for the POWER of the Holy Spirit as much as thanking Him for His PROMISE to empower us and equip us. Oh yes we cry out for the Holy Spirit to work in the lives of those He’s pulling to Jesus and to lead us to the ones He’s already been tugging at their hearts. We had a few short conversations with some other folks, but then we got chatting with another young man, this time he told us; “I used to go to church, got baptised as a baby, attended Sunday School, went to a Church School and got confirmed, but it meant nothing to me”… I said, “Do you think you are good enough to get into Heaven when you die?”… He said, “I hope so”. He believed in Heaven, God and Sin and Hell. We began to go through the Commandments and the surprise on his face was evident, he said, “That means no one is good enough to get into Heaven, because we’ve all fallen short of God’s holy standard”. WOWzer! He got it, but still I pushed his understanding a bit more. “Do you know what God has done so that nobody needs to end up in Hell?” He said, “Yes, Jesus, He died upon the Cross to save us from our sins”… I said, “How do you get that forgiveness?” He said “Ask God to forgive you” I said, “Partially, but the Bible tells us we must; Believe that Jesus died for our own sins, those nails being hammered into his hands were for our lies, theft, lust and hatred of others, then we must repent of those sins and receive Jesus as our Lord and Saviour”. He said, “That makes sense”… I shared what it means to actually trust in Jesus, i.e. You wouldn’t jump out of a plane without a parachute would you? No you’d put the parachute on, it’s the same with Jesus, just believing that He can save you is not enough, you’ve got to actually trust in Him and receive Him by faith. I gave him my calling care, and we’re going to meet up for a coffee in Costa (or somewhere 🙂 ) to talk about it a bit more about Jesus. Ben and Judy have opened my eyes to see that just sharing the Gospel of making Converts is not enough: Jesus didn’t call us to make ‘converts’ but to grow Disciples, followers of Jesus and to see that people begin to be obedient to what they know, as soon as possible after being converted. But long before Ben and Judy came, the LORD had already been working on my own heart about this, because we’ve been preaching through the Gospel of Mark. I’d already seen that Jesus called people, demonstrated the Kingdom and then sent them out, almost immediately after calling them to follow himself, then when they came back, they were amazed that when they used Jesus’ name, even the Demons submitted to them. However, this surprised me, listen to what Jesus said to them (read it out loud my friends). 13 “Woe to you, Korazin! Woe to you, Bethsaida! For if the miracles that were performed in you had been performed in Tyre and Sidon, they would have repented long ago, sitting in sackcloth and ashes. 15 And you, Capernaum, will you be lifted up to the skies? No, you will go down to the depths. 23 Then he turned to his disciples and said privately, “Blessed are the eyes that see what you see. Can you see now why we encouraged Emma to come out with us last night? Emma is not ‘wise or learned’ she was a very recent convert, much like the 72 that Jesus sent out above, but they’d seen enough, they knew enough and they went out in obedience and returned with great JOY. Why? Because they’d seen how the KINGDOM of God was near when they shared the Good News about the Kingdom. We’ll see that too, but only when we’re obedient and begin to share the Kingdom, the Good News of Jesus. Because “even the demons submit to us in your name”… They’d seen the battle head-on and the power of the Kingdom to subdue the demonic. You’ll see that too, but only when you go out in obedience to Jesus Kingdom Commands. We too can rejoice, but we should rejoice much more, that because we’ve trusted in Jesus Christ for forgiveness and salvation, that our names are now written in Heaven. My friends, Jesus is working in Emma’s life, She’s seeing the Kingdom Power and she’s only one week old as a Christian. God is revealing it to babes in Christ. It’s not about learning more or knowing more about God, the Bible etc, it’s about being obedient to what we know already. That’s what’s been challenging me lately, because I know so much, but I’ve discovered just how disobedient I’ve been to what I know. Let’s get more of a desire to do what Jesus told us to do, to learn His teachings and to do them. Bev and I paired up last night, and she and I saw the Kingdom Power to bring conviction, encouragement and enlighten people in the darkness. It’s when we share what we know, that we’ll see the Kingdom Come. Let’s get going and see a mighty move of God in London, the UK, the world. Amen! “Thy Kingdom Come”….Amen. Whoever has ears to hear what the Spirit is saying to the church, let them hear. Amen. P.S. I must share a funny story: On Tuesday we had a Pastor’s Meeting in West Norwood: Five of us met to discuss the vision for an event in St Luke’s Gardens on Saturday 16th July, we’ve been led to call it; “Oh Happy Day”. But after the meeting I was walking down the road with Dennis, the Pastor of World Wide Mission Fellowship. He was on the phone to a young man. When he finished his call he said to me, “I’m meeting a young man in a minute, will you ask him “How is Jesus the Lord?”” I said, “OK Dennis, I will” but just at that moment I spotted a huge man, he’s massive, built like an OX, I said, “Dennis, you say the same thing to him”… Dennis just looked at me…he said, “No, you share with that one” I did, I said, “Do you know Jesus is Lord?” … The huge man was Dave from our fellowship, Dennis and I laughed and laughed. You see, it’s wanting to be obedient, that’s what counts. Afterwards, we met the young man, his name was David too. Is the LORD calling the DAVIDS in our Community? Are you prepared to SHARE Jesus with ANYONE? Don’t go by appearances, don’t go by what a person looks like, because the LORD doesn’t look at the outward appearances, He looks at the HEART. He’s calling ALL people to himself. If we just looked at the outward appearance we’d miss the people the Lord wants us to talk with. If someone is dressed in a smart suit, looks nice and clean, they need Jesus just as much as a man dressed in shabby clothing. All have fallen short of God’s Holy Standards. All need to come to repentance. All need a Saviour from Hell. No my friends, don’t look at how big they are or how small they are, how smart or intelligent a person appears to be, God’s calling EVERYONE into His Kingdom family, they all need Jesus. You can do the IMPOSSIBLE with Jesus: Peter walked on water with Jesus. Jesus said, “Apart from me you can do NOTHING”… i.e. everything we try and do, that doesn’t involve Jesus, is NOTHING. However, Jesus also said, “You will do even greater things”…. Awesome! P.P.S. Please pray for our West Norwood: “Oh Happy Day”, it’s coming on Saturday 16th July in St Luke’s Gardens. An event for the whole family, Christians united together to share the GREAT things God is doing in this world today. There will be Bands, Choirs, Dancing, Singing, Stalls with Photography, Face-Painting, Exercise (for every ability Kingdom Stretch), Food stalls, Books, Booklets, etc etc… Come to “Oh Happy Day” St Luke’s Gardens, West Norwood. Saturday 16th July. EVERYONE is WELCOME. Daily Spirit & Word: 746: The KEY to Unlock AWESOME Fellowship. The closer Christians get to Christ, the closer they get to one another. Good morning my friends, there’s something I hear from time to time in church gatherings, people feel slighted or left-out of things, so they stop coming to church. They forget that our battle is NOT against flesh and blood, but against spiritual forces of evil in the heavenly realms. That ‘flesh and blood’ includes our own flesh and our own blood; our thinking and our feelings. What needs to be done when we’re feeling left-out? Get ever closer to Jesus. I’ve asked countless people who’ve felt miffed by church members, hurt or offended, “How’s your Bible reading going?” “FINE” they’ll say, but it’s the way they answer that I’m listening to, more than what they say. “How close to you feel to Jesus today?” You know what they respond with, “Oh I’ve always loved Jesus”… My friends, let me say this as gently as I can, if you are feeling hurt or offended, then unless you deal with it by taking it to Jesus, you are opening the door of your heart for Satan to come in, when you do that, he will steal from you, kill your passion for fellowship with Jesus and those in His family, and destroy your walk with the LORD. You’ll know your are loosing the battle for your soul, if you’re desire for close fellowship with other brothers and sisters in Christ is slipping. You’ll know you are loosing the battle for your soul, if you don’t want to read God’s Word, pray, praise and witness for Jesus. You will feel isolated, hurt, offended, alone. How can those hurts be healed? Turn AGAIN to Jesus: Repent of the bitterness you’ve been feeling towards someone. Satan is a great LIAR, the Bible calls him the father of lies. He’ll want you to be nursing your hurt. He’ll want you to hold onto it for a long time. He knows it will DESTROY you. He wants you to get upset with your brothers and sisters in Christ. He loves nothing more that a wounded soul festering in their hurt. When you get hurt, learn to forgive each other quickly or it will turn to bitter anger and hatred which is MURDER. You can’t forgive someone or a group of people if you are far away from Jesus. You can’t run away from that hurt either, by staying away from church gatherings. You can’t fool God, He knows what’s happening on the inside. Unless you forgive, then neither will your own sins be forgiven. We’ve been praying the LORD’S PRAYER every day (as part of the lead-up to Pentecost), but as part of that prayer, Jesus taught us to pray about FORGIVENESS, he told us about FORGIVENESS TWICE. Why did Jesus do that? Because He KNOWS we’re going to be offended and hurt by one another. THAT’S NOT THE END OF THE LORD’S PRAYER AT ALL. 14 For if you forgive men when they sin against you, your heavenly Father will also forgive you. 15 But if you do not forgive men their sins, your Father will not forgive your sins. 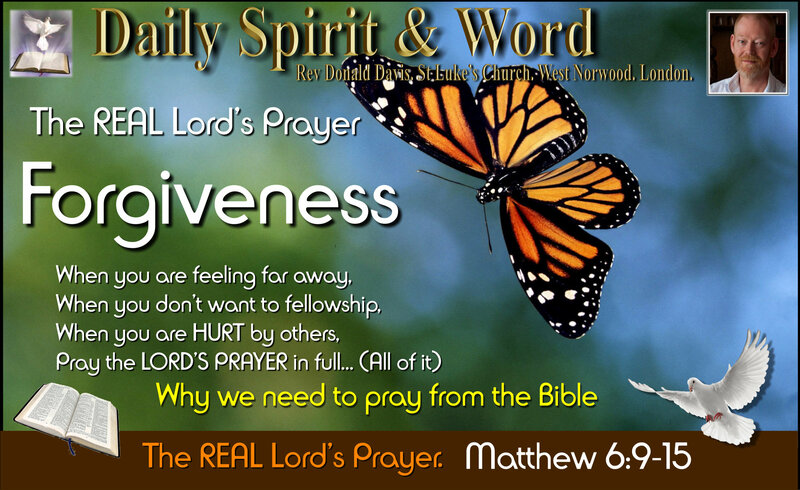 The Real LORD’S Prayer is all about forgiveness. So, let’s pray the LORD’S PRAYER properly, as Jesus taught it. It’s all about forgiveness, letting God’s Kingdom rule and not allowing Satan to get a foothold into our lives by harbouring grudges and not forgiving others. We all want to be forgiven by the LORD. In His Kingdom there isn’t going to be any lingering thoughts of hatred or bitterness any more. Your sins are washed away by Jesus Christ, His blood purifies you from all sin. But that forgiveness can be BLOCKED. Jesus knew that, that’s why He taught His disciples twice in his prayer about FORGIVENESS. UNFORGIVENESS OPENS THE DOOR FOR EVIL TO COME INTO YOUR HEART. “Lead us NOT into temptation” We are tempted NOT to forgive. Especially when we get hurt by someone who’s meant to be following Jesus. When we’re walking around with UNFORGIVENESS in our hearts, we just can’t get close to Jesus. UNFORGIVENESS is the sin that blocks our access to Him and to our own FORGIVENESS. You may not think that you’ve got anything to worry about, you are a ‘good’ person, but don’t be deceived my friends. Every one of us SINS every single day, we all need forgiveness, all the time. If you want to get better fellowship, if you want to feel close to other Christians again, to get closer to your brothers and sisters in Jesus, then you are going to have to face the hurt head-on, take it to Jesus, ask Him to forgive you for holding onto it for too long, then release your friends by forgiving them. You will very quickly discover a NEW JOY comes flooding into your soul. Some people have likened it to their first EXPERIENCE of coming to Jesus. He’ll wash you clean and give you instant fellowship with Himself. He’ll restore your LOVE for each other. He’ll enable you to totally forgive them to such an extent that you’ll want to bless them and see them being blessed by Jesus. My friends, the LORD’S PRAYER is all about FORGIVENESS. God’s forgiveness of your sins and your forgiveness of EVERYONE who hurts or offends you in some way. It IS the LITTLE FOXES that ruin the vine. When we let little hurts linger, we’re allowing the little foxes to pull the vine to pieces. Those little thoughts that we nurse, we allow them to ruin the VINE. God wants you to be so full of fruit, but the little FOXES will tear it to pieces. Get right with Jesus by FORGIVING others. Get close to Jesus by RELEASING your friends from their debts, trespasses and sins against you. Get close to Jesus and you will get closer in fellowship with the saints in your church fellowship. But what if it’s YOU that has HURT or OFFENDED someone? They don’t want you to come and say “Sorry”, because that would release you. They NEED our LOVE: Not our apology. LOVE: “Love covers over a multitude of sins”… LOVE heals those wounds and hurts. “Love one another, as I have loved you.” How did Jesus love us? He died so that we could be forgiven. So my friends, we too must be prepared to DIE every day, in order that LOVE may abound within our fellowships. Die to pride, even if you think you’ve done nothing wrong, go and get right with the offended party quickly. In that way you can stop the little foxes tearing the vine to bits. Even those thoughts of hurt, anger, bitterness, hatret, wounds, feelings. Then we’ll get close to Jesus and our fellowship will be restored. Forgiveness really is the KEY to Unlocking AWESOME Fellowship. 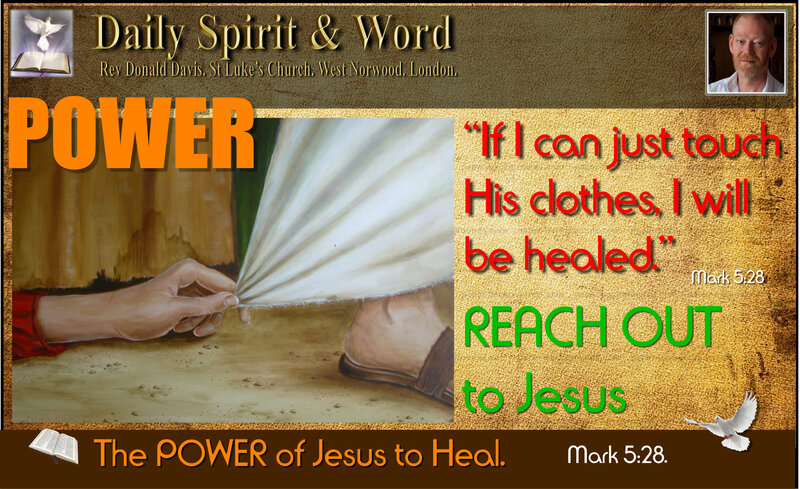 Daily Spirit & Word: 717: The Power Of Jesus Word. We’ve been following through Mark’s Gospel and we’re now on Chapter 5. The last teaching was about Jesus Power and Authority over Satan and The Demonic, today we observe Jesus healing and raising a little girl from the dead. The Woman who has been bleeding for 12 years. The Little Girl was 12 years old when she died. 21 When Jesus had again crossed over by boat to the other side of the lake, a large crowd gathered round him while he was by the lake. 24 So Jesus went with him. A large crowd followed and pressed around him. 25 And a woman was there who had been subject to bleeding for twelve years. 26 She had suffered a great deal under the care of many doctors and had spent all she had, yet instead of getting better she grew worse. 27 When she heard about Jesus, she came up behind him in the crowd and touched his cloak, 28 because she thought, “If I just touch his clothes, I will be healed.” 29 Immediately her bleeding stopped and she felt in her body that she was freed from her suffering. 32 But Jesus kept looking around to see who had done it. 33 Then the woman, knowing what had happened to her, came and fell at his feet and, trembling with fear, told him the whole truth. 37 He did not let anyone follow him except Peter, James and John the brother of James. 38 When they came to the home of the synagogue ruler, Jesus saw a commotion, with people crying and wailing loudly. 40 But they laughed at him. After he put them all out, he took the child’s father and mother and the disciples who were with him, and went in where the child was. 41 He took her by the hand and said to her, “Talitha koum!” (which means, “Little girl, I say to you, get up!”). 42 Immediately the girl stood up and walked around (she was twelve years old). At this they were completely astonished. 43 He gave strict orders not to let anyone know about this, and told them to give her something to eat. 12 Years Bleeding: “Just One Touch and I will be healed”. My friends, that’s real FAITH. “Immediately” Jesus realised POWER had gone out from Him. That touch of faith brought the POWER of HEAVEN. FAITH: is believing without doubting. It’s a GIFT from God, so that no one can boast. All faith is a Gift from God. But remember, our FAITH in what God can and will do will grow the more that we know that we can TRUST Him. It’s a kind of faith that believes without doubting. Do you have that kind of faith? Let me illustrate: You already have that kind of faith. A Chair: How do you know that the SEAT you’re sitting on can hold your weight? When you came in here today, you didn’t stop to check the chair out, to see if it was wobbly or anything, you just sat right down on it. If you were a stranger walking into this building today, how would you know you could sit down and the chairs would support your weight? That’s right, you can see other people sitting down. Lots of them, and they are not falling to the floor with everyone laughing at them. Also Past Experience of sitting in chairs, they’re pretty dependable aren’t they. In the same way that you can see others have trusted their chairs and not fallen to the floor, you can also see that in this place, some of the people have put their faith in Jesus Christ. No matter what happens in their lives, they don’t fall down, their faith remains, they keep trusting in Jesus, but why? Why do they keep trusting in Jesus, even when life get tough? It’s because they know Jesus, long years of reaching out and touching the Saviour in faith, have given them the assurance that He’s in complete control and knows what He’s doing. So if you can see that others have had FAITH in their seats, can you see how impressive it is that others have that same kind of FAITH in Jesus. They have sat in those seats many times, so when they walk in to church they don’t even think about it. What amazing reasoning: “If this Jesus can heal people of all kinds of diseases and deliver them from Demons, then a little issue of bleeding for 12 years will be nothing for this Miracle worker, all I need to do is reach out and touch Him”. NEXT: Jesus Brings LIFE back into a 12 year old dead girl. The Girls Father: first a word about Jairus. What encouragement Jesus gave Jairus. He was a Synagogue Ruler… The Synagogue was a place of worship for Jews. Jairus was a very important man in society. “Jairus FELL AT HIS FEET”: Here was a Ruler falling at Jesus feet and begging Him… My friends, if you want Jesus to do something for you, something you are desperate for the King of Kings to do for you, have you gotten to the point of falling to your knees and pleading with Jesus? Sometimes, we don’t get answers to our prayers UNTIL we’ve gotten to our knees in prayer before God. It’s not the act of kneeling, it the act of recognition of who Jesus is. Jairus knew only that Jesus was a Miracle worker and teacher. We know that Jesus was God on Earth, that He died because of His love for us, so that we could be forgiven and cleansed of all sin. When we kneel before Jesus today, we’re kneeling before God. KNEELING: can be just a habit: many people kneel in prayer because that’s what they’ve been taught to do. But there’s another kind of KNEELING: It’s A Humbling yourself before God. It’s recognising that you don’t deserve anything from Him and yet still coming to Him. Pleading for His grace, mercy, kindness… He loves our FAITH… He loves our TRUST… What’s stopping us KNEELING before Jesus? Jesus is the KING of Kings and Queens. Our Queen has famously said, “I bow the knee to only one other KING and that’s KING Jesus Christ”… The Queen bows to Jesus. Jairus, the Ruler of the Synagogue was in good company… But have we actually BOWED before Jesus? The Queen Touches with her sword and says “Arise”… But the KING, our LORD Jesus touches and we cannot help but rise to new heights. Just ONE TOUCH of the KING… Changes everything… (I love that song, because it speaks of a TRUTH about my King Jesus). If it’s us reaching out to Jesus in FAITH: Like the Woman bleeding for 12 years. Changed her life forever. POWER of Heaven Opens: By Faith. If it’s up Jesus reaching out to us in His MERCY: Like the little girl’s father, Changed her life forever and her family’s life forever. POWER of Heaven Opens: By Faith. Just ONE TOUCH of the KING: Changes EVERYTHING. Notice the CROWD that didn’t believe. Like they laughed at Noah, when He built the ARK of God. Like Sara laughed when the LORD said she would have a baby when she was nearly 100 years old. My friends, if someone came to you and said, “I’m building an Ark because God is sending a flood to destroy the Earth” you’d probably laugh too. If someone came to your funeral and said, “Put the boy down, I’m going to bring him back to life” You’d probably laugh too. If someone came into a hospital today, when the doctors has said, “He’s DEAD” and he said, “He Going to LIVE” those Doctors would probably laugh too. What did Jesus do when they laughed at Him? That’s right, He put them out of the room. (Mark 5:40). My friends, it’s a DANGEROUS thing to Laugh at God. Laughing is Doubting when there’s EVIDENCE that it’s possible. That kind of laughter is an insult to God. Jesus put them out of the room. God put Adam and Eve out of the Garden of Eden, when they doubted God and believed the Devil. God put Abraham’s wife Sara out for a while, when she laughed, when told in her old age she’d have a baby. God put Zechariah, John the Baptist’s Dad out for a while when he laughed, when in their old age he and Sarah would have a baby; He was struck dumb until he wrote what the Angel told him, “His name shall be John”. Unbelief (Stubborn Doubt) means exclusion from the things of God. “He put them all out”… For laughing. For their unbelief. My friends, if you are LAUGHING at the possibilities of what God can do today, be aware that it’s going to be very costly indeed. You might just miss the best Miracles you’ll ever witness in your life; only the parents and Jesus’ disciples; Peter, James and John, observed Jesus touching the little girl and her coming back to life. 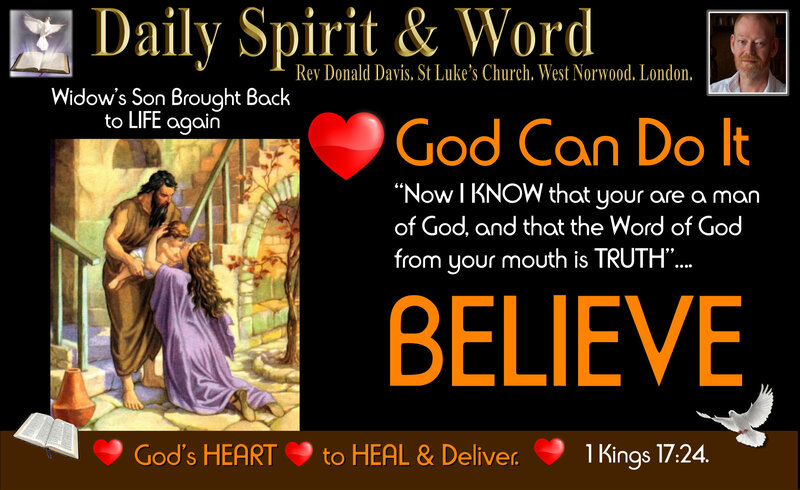 Remember what Jesus said to Thomas: “Stop DOUBTING and BELIEVE”…. “It’s ME”…. Jairus trusted Jesus, instead of laughing, Jairus was full of hope and expectation and faith, he was with Jesus and His disciples in the room when Jesus touched the little girl and LIFE came back into her dead body. That touch of Jesus would change Jairus’ life forever. He didn’t just give back her life, Jesus took care of her hunger too. That’s how much Jesus cares for that little girl my friends. Do you know, that’s how much Jesus cares for you too. When you get the NEW LIFE Jesus wants to feed you with Manna from Heaven, The Word of God. With Just a WORD the 12 year old girl received life. With Just a WORD from God, the Universe was formed. With Just a WORD from Jesus, Demons flew out of a man. With Just a WORD from Jesus, The Storm was stilled. With Just a WORD from Jesus, The Crippled man’s hand was restored. With Just a WORD from God: Mankind came into this world. With Jesus WORD Lazarus came out of the grave. There is POWER in the WORD of God. With Just a TOUCH: Moses parted the Red Sea. With Just a TOUCH: Water poured from a Rock. With Just a TOUCH: Jesus opened a Blind Man’s Eyes. 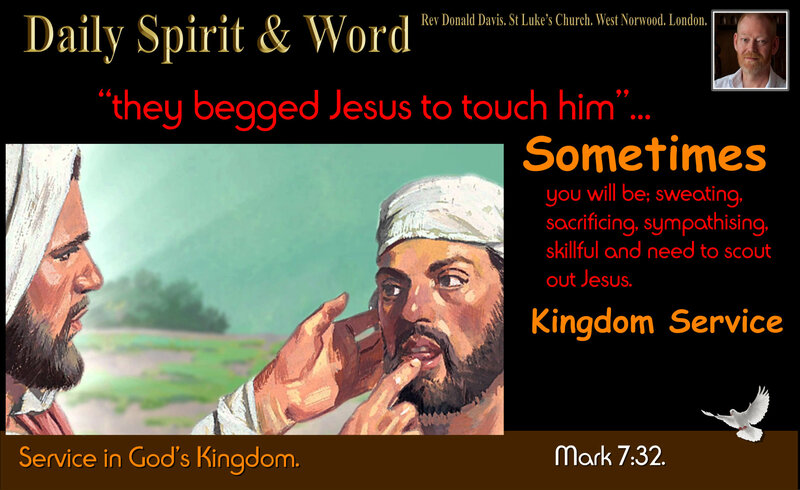 With Just a TOUCH: Jesus opened a DEAF Man’s Ears. There is POWER in the TOUCH of the SAVIOUR. My friends, Do you believe? Do you have faith? Do you TRUST Jesus can do all that He promised He can do? He will come into your life: If you turn in faith and trust in His death upon the Cross for your sins. When you repent and put your FAITH in Him, He’ll do it. Do you believe that Jesus will come into your life? To give you NEW LIFE… Once you get NEW LIFE, you’ll also get a NEW HUNGER (New Desires) for the WORD of God. NEW DESIRES to live God’s way: His righteous life. Just like you’ve seen others sitting in these chairs and believe they can hold your weight. You have FAITH in your seat. He’ll not only give you NEW LIFE, but a NEW HUNGER too. How’s your hunger for God’s Word? It’s an indication of your place in God’s Family. DELAY: When I was 12 Years Old. My mother ran a bath for me. She shouted out to me, “Donald, your bath is ready, the water is warm, come and get your bath before the water gets cold”… I dillied and dallied and by the time I got into that bath, the water was cold. DON’T Dilly and Don’t Dally, the WATER of FAITH is warm today. Jump in and take the plunge and trust in Jesus. What if you’ve done that already? You’ve TRUSTED Jesus. You might still be laughing like the CROWD: What about the Plans God has for you? Have you laughed inside yourself, thinking I couldn’t do that, I don’t have the strength, the power or the personality… What’s God been calling you to do for Him, but you’ve laughed or doubted? Sara (Abraham’s wife got the shock of her life when she listened in on the conversation) an old lady having a baby; impossible. My friends, God might be calling you to do something for Him that at this moment in time might seem beyond your capacity, your ability, your power, but believe Him, recognise His POWER to do all things, even with you. He’s done it before and He can do it again through your life. Is Jesus calling you to use your GIFTS in His Service, in the Service of the Kingdom? Remember the weaklings in the Bible that God chose for great things; Moses, Gideon, Jeremiah, they all thought they were not upto the task or calling, but God transformed them all. So my friends, I’m going to ASK YOU: Will you TRUST Jesus Christ: The POWER of His Word, The POWER of His Touch? Believe me and everyone else here today, who’ll tell you, “It’s TRUE: Jesus Christ has done it for me and He’ll do it for you too”. Take the plunge, jump in whilst the water is warm and the time is right. Reach out in Faith and FEEL the POWER of God coming into your life again today. NOTE: When delivering this sermon at an All Age Service yesterday, I split it into two: The Woman with the Issue and then the 12 Year old dead girl. I used another illustration to show the little bit of faith we might have and it’s power. A glass of water held over someone’s head, up-side-down… The water didn’t come out because a flimsy piece of paper stopped it. The paper is thin, sometimes our faith appears weak, but it has a might force behind it. When we use our faith, exercise the little faith that we have, Heaven’s Power is Available. Amen! He is my EVERYTHING, He is my ALL. 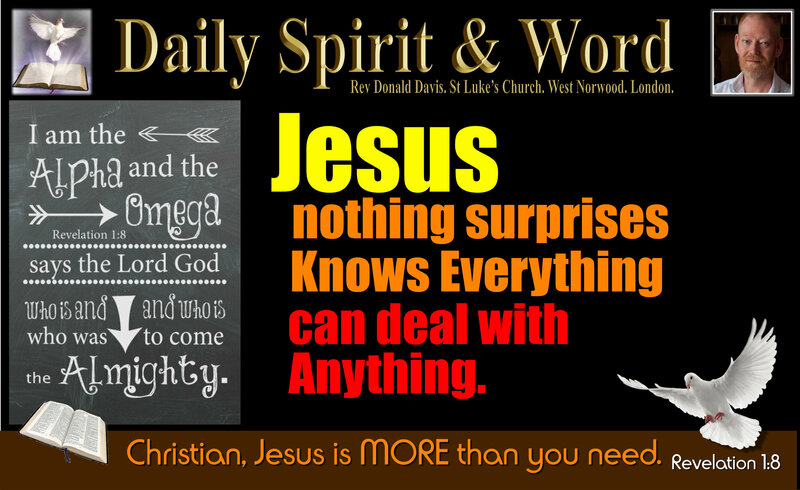 Daily Spirit & Word: 682: Jesus IS Your EVERYTHING. Jesus really IS ALL you need. Good morning my friends, today we’re back with Revelation 1:8 where we discover just how much Jesus knows about everything. Last night we celebrated Ash Wednesday in Fellowship. Did you know that Ash Wednesday marks the beginning of Lent? Lent is a time when we think about Jesus temptation in the Wilderness for 40 Days and 40 Nights. During that time Jesus didn’t eat or drink and it was after being without food for such a long time that Satan (The Devil) came to TEMPT Jesus. Note: Jesus was put to temptation when He was at his weakest. But revealed a secret strength that is available to you and me today. Today, in Revelation, we’re going to see how Jesus is EVERYTHING we need in the face of temptation, moments of weakness, times when we’re feeling we just can’t go on: He’s the ONE who’s able to carry us through. Why? Because Jesus is the I AM for your everything. John is giving us the REVELATION as he received it from the LORD Jesus. Jesus is the one speaking. He is GOD ALMIGHTY. Alpha: Is the first letter of the Greek alphabet. Omega: is the last letter. So Jesus is telling us He’s the first and the last and everything else in-between. He’s the A, B, C, D, E, F, G, H, I, J …. Everything. He also tells us: I AM (Which is the Bible name for the all knowing, all powerful, all sufficient, God). He’s the “I AM” who IS: He exists in your present. He’s the “I AM” Who “WAS”: i.e. He always existed in the past. He was before time began. He created time. He’s the “I AM” Who “Is to Come”: i.e. He will always be around for all eternity. He’s never going away. He will exist when the Creation ceases to exist. He’s coming back to Earth to Judge all mankind. He’s showing you that He is the “I AM” for whatever your need is in life. If you’re in a storm in life, you’ll hear Jesus say “I AM your life-boat”. If you don’t know your way, can’t make a decision, Jesus will be revealing, “I AM the WAY”. If you’re in the dark, afraid and can’t see, Jesus is your light, for He promises, “I AM the Light of the world, whoever follows me will never walk in darkness”. If you are feeling happy, Jesus is your brother who’ll share in your joy. There’s NO jealously in God. He rejoices with you and doesn’t envy your happiest moments in life. My friends, in Jesus, in Revelation, Jesus is the ALL KNOWING: “I AM”. He is everything that you can ever imagine that you’ll need in life. He’s the ONE: Who washes you clean from sin. He does that with His own life-blood. He died so that you could be purified. He’s the ONE: Who give you Eternal LIFE: The moment you turn in Repentance and seek His forgiveness and receive Him as your LORD and Saviour, at that moment ETERNAL LIFE is your inheritance. Awesome! He’s the ONE: Who’ll give you abundant, overflowing LIFE: As you walk each day with Jesus, no matter what the world throws at you, as it did Him in the wilderness, you’ll be full of Holy Spirit and JOY of the Lord Jesus. So this Lent, to be afraid to try and give up something you like, you’ll discover that Jesus can more than replace and resource you in ways you can’t even imagine, because HE is your EVERYTHING: He is your ALL. He knows more than any Professor on Earth: He Created the Universe and everything in it. TRUST Jesus Christ afresh today. He always was, always will be and always is. Jesus is the Lord God Almighty: He’s with you. He’s in you. So don’t give up or give in. The Wonderful Friends, The Wonder-Filled Crowd & The Wonderful Words of Jesus. Jesus Has The Power & Authority to Forgive Sin. SHOCKING NEWS: I was filled with a deep sickening-feeling when I watched the news that so many people had been killed by those murderous terrorists in Paris. We’re with the French Nation! Grieving with you over your loss of so many young loved ones. It’s a scar that will be painful and will hurt for a long time to come. I couldn’t call them soldiers or that this is a war, because that would elevate them to an army. They are pure merchants of an evil that’s running rampant over the face of the earth. Praying for PEACE and in God’s timing that the good people of France will be enabled to FORGIVE. For when we forgive, then we are set-free. O LORD, please bring the comfort that You alone can give in the face of death. Amen! Good morning my friends, today we’re back with Mark’s Gospel and chapter 2. The familiar story, recounted in many a Sunday School Class, the famous account of the four friends who brought their friend to Jesus to be healed, but couldn’t get in at the door so the climbed-up, made a hole in the roof and lowered their friends to the feet of Jesus Christ. Mark 2:1-12. The Paralysed Man: Forgiven and Healed. Four Wonderful Friends. 4 Since they could not get him to Jesus because of the crowd, they made an opening in the roof above Jesus and, after digging through it, lowered the mat the paralysed man was lying on. There are so many wonderful lessons and sermons I’ve personally heard about this account. I’ve preached upon it many times myself, but today I was struck afresh by these four men and Jesus response and the crowds of people in the house that day. What amazing friends this paralysed man had. Some people imagine that when someone is paralysed that they will be that way for the rest of their days. Those Wonderful Friends didn’t think like that; they had FAITH that Jesus could heal their friend. My friends, I do have a hope, I do believe with all my heart that Jesus can and does do miracles today. I’ve seen miracles of healing and I believe, like those four wonderful friends obviously did, that their friend is worth bringing to Jesus Christ. Jesus came into this world to SAVE everyone. Not everyone will be SAVED but that’s what Jesus wants, be certain of that my friends. How were they Wonderful Friends? They Cared: They didn’t give up when they couldn’t get in through the door. Some of us give up too easily on those we’re trying to bring to Jesus Christ, but not these friends. You may have been trying for years to get a loved on SAVED, but they refuse to come to Jesus. Be like those friends, who were not put-off by the crowds at the door. Some of us, when we’re met with an obstacle, just give-up, just put-off by the obstacles, but instead they got creative. It might take an unusual approach to save your friends and relatives. It might mean you’ll have to think of another way. A different or novel way. The must have said amongst themselves that day, “We can’t get in through the door, but look, there’s a roof and we can easily break through the roof and get him into see Jesus”… That’s creative. Not only did they care, they were not going to be put-off and they got very creative. They Were Commended: Not only did they care and get creative, but they were commended by Jesus for their faith. It wasn’t the paralytic’s faith that was commended that day, it was the faith of the friends who struggled to bring him to the feet of Jesus Christ. Will you be commended by Jesus because of your FAITH? The faith they demonstrated was obvious; their faith had legs, they didn’t let obstacles get in the way, they tried their hardest all all costs to bring their friend to Jesus. They BELIEVED that Jesus would and could HEAL their friend. What wonderful faith, what wonderful friends. O my friends, if only we had a church full of people who were longing to bring their friends to faith and trust in Jesus Christ. If only we’d bring our loved ones to Jesus. If our Church was not put-off by obstacles, think how full our church could be. They may not be able to come themselves to Jesus: You Bring Them. They may not want to come to Jesus: You Bring Them whatever way you can. Carry Them. They are paralysed by sin, powerless to save themselves. You show them they can be SAVED by Jesus. They’re not looking to come to Jesus: They are BLIND and cannot see their NEED of Jesus or Church: we must open their blinded eyed and bring them to Jesus. “When Jesus saw their faith”: The man’s sins got forgiven. Imagine: You’ve struggled to bring your paralysed friend to Jesus. You’ve heard that He’s a healer and all He does is say, “Son, your sins are forgiven you”… What? I mean, “We’ve just dug through a roof, we’ve not been put off by the crowd, we’ve lowered our friend on ropes to your feet and all you do is forgive him his sins?” But Jesus is NOT finished yet. One last thing about the Wonderful Friends: The worked together to bring their friend to Jesus. That tells me afresh today; “Donald, don’t try and do it all alone. Work together to bring people to Jesus.” It’s a TEAM effort. We’ve got to be working together. There’s always something you can be doing: If you can’t be an Evangelist, you can be a prayer. You can be a meal-giver, you can be a host, you can be a helper, you can be a giver, you can be SOMETHING as part of the TEAM Here are St LUKE’S Church to bring people to Jesus. Only four of the group were carrying the man, there were more than four of them. All those people, bringing their friend to Jesus. Think: When we’re joined together in UNITY there the LORD commands His blessing. The Wonder-Filled Crowd: They were all crammed into that house to hear Jesus teaching. So many that the sick couldn’t get in. They were filled with wonder, but they’d become a stumbling-block; blocking access to Jesus that day. The Church Today is FILLED with the WONDERERS: They love wondering at the words of Jesus, they love sermons, they love healings, they love miracles, they love the spectacle of power ministries, but just like the Wonder-Filled Crowd back then, they become a blockage to people coming to Jesus today. They don’t care: Even if they do care, the don’t show their faith, by doing something about it. How do we know they were a blockage? It’s revealed when Jesus said those amazing words; “Son, your sins are forgiven you”. That Wonder-Filled Crowd knew that ONLY God can forgive sins. They were right too, these TEACHERS of God’s Law: ONLY God can forgive sins. My friends, if ever there was a passage in the Bible that shouts-out about the Divinity of Jesus, that Jesus is God, it’s this one (there are many, many more) but they KNEW that Jesus was claiming to be God by saying, “Son, your sins are forgiven you”, because ONLY God can forgive sins. But instead of praising Jesus Christ as God, they began to accuse Him of Blasphemy in their hearts. Many times these Jewish Teachers of the Law wanted to stone Jesus to death for His blasphemous words. They were there, crowded into the house, listening to the wonderful teaching of Jesus, but they were not all there to praise Jesus. Some of them were there only to be critical and cynical. Not everyone in that house that day was filled with a desire to be a follower of Jesus. 3) The Wonderful Words of Jesus. Before they could utter their thoughts out loud, Jesus took the initiative, by REVEALING THEIR THINKING. Not only is it ONLY GOD that can forgive sins; but ONLY GOD knows what a man is THINKING. That alone should have convinced them that this man Jesus before them was God on Earth. No ONE on Earth or in Heaven can read your thoughts, but God ALONE (Jesus is God). No ONE on Earth today can say to a Paralysed man, get up and walk and he’s healed and walks. Only God can do that kind of miracle. This again, the third thing that day, proved that Jesus was God. MARK 2:10 To PROVE THAT Jesus, “The Son of Man” (Messiah Title) Has the Authority to FORGIVE SIN: He performs this miracle. These Wonderful Words of Jesus, to Prove He was God on the Earth, “I tell you, get up, take your mat and go home”… He did and they were all amazed. He did it in full view of them all. The Miracles was to prove to the doubters that day and today that Jesus is God. He has the authority to forgive sins, only God can do that. The Wonderful Friends: Who are full of faith, undaunted by obstacles, creative in bringing their friend to Jesus and caring enough to consider that not even a paralytic is beyond the reach of Jesus power. The Wonder-Filled Crowd: They’d become a blockage to people coming to Jesus. Not everyone was there for right reasons. Be certain that you are not coming to Church just to wowed and to wonder, but to work for Jesus too. Forgiven and Healed: Forgiven and Commanded; Forgiven and Commissioned. Thoughts: Are you being a Wonderful Friend to someone today? Is there someone you can bring to Christ? Don’t be put-off, deterred, disheartened, disillusioned, by a blockage. They may not be willing to come to Jesus yet: don’t ever give-up on them, what may seem impossible now: Is POSSIBLE (All things, all people, everyone; can come to Jesus). There’s no one beyond the help and hope of Jesus POWER to reach them. Like the Paralytics Wonderful Friends: Be creative, Have faith, Keep going when everyone else gives up. BE AMAZED: Like the Wonder-Filled CROWD: Let these words of Jesus fill you with wonder every day. Let Him come to you afresh. Let Him dazzle you with amazement. Only Jesus knows what they were thinking, ONLY GOD Can Do That: Jesus is God. The Wonderful Words of Jesus: He’s saying to you today “Your sins are forgiven, now get up and go for Me into this world and proclaim the Good News”…. That’s the Wonderful Good News Gospel of Jesus. You’ve got it my friends, now go and give it away; Be part of the Wonder-Filled Crowd who were there to listen to every word of Jesus, Be like those Wonderful Friends and let the Wonderful Words of Jesus impact your HEART today. Amen! I hope you all have a WONDERFUL Sunday full of JOY in the LORD Jesus Christ. Jesus Comfort In The Face of Death. God’s Comfort In The FACE of DEATH. Good morning my friends, I know the title sounds bleak, but bear with me because there’s great encouragement and comfort today; God WANTS to REVEAL Himself to you today. When Jesus was nearing the end of His earthly mission and He knew what was about to happen to Him, His thoughts were not for Himself, He was thinking about how His disciples would feel once He’d gone back to Heaven. He was thinking about them all because He loved them and knew that they all loved Him too. When someone we LOVE departs this Earth, it hurts. No matter how prepared you are for that event, deep down it tears something from your soul when a loved on leaves. I’ll never forget my own mother’s death: We knew a week before she died that she’d only have one week left in this world. The Doctors had to stop her Dialysis Treatment: She was in the Renal Ward and the treatment wasn’t working. She was also riddled with Cancer. I had to break the news to my mum along with my dad that she only had a week to live. Although everyone knew she was coming to the end of her life, when she eventually died it was as if something was ripped from my own soul and a sick, empty feeling continued for many hours in my stomach. When Jesus knew what was about to happen, He felt for His own disciples too. So with these words our Lord began to comfort them: Imagine getting this kind of assurance at the impending death of a loved one. John 14:15-27 God’s Comfort In The Face of Death. The LOVE: That God has for His Son, the Son (Jesus) for the Father (God). The LOVE: That God has for those He’s brought to His Son Jesus. The LOVE: That God the Son has for those He’s been teaching and training for over three years. The LOVE: That those who’ve been following Jesus have for Him and for God and for each other. It’s ALL ABOUT LOVE: And love hurts. Verse 18: “I will not leave you as orphans”… An Orphan is one who’s bereft of parents. He’s hurting because he’s alone in this world. But Jesus is promising that they’ll get another counsellor and guide: God the Holy Spirit. God the Son is going to be replaced by God the Holy Spirit. It’s going to be different though; instead of God walking with them, talking with them, eating with them, He’s going to be INSIDE them. They’ll know God from now on in a very different way. There is a condition attached to this REVELATION that’s about to happen. The internal revelation and presence of God the Holy Spirit will only happen to those who are OBEDIENTLY seeking God. God will never and can never show Himself to those who don’t want to know Him: those who are DISOBEDIENT. NOTE: That doesn’t mean we need to be sinless or perfect to get a revelation of God. It just means we’ve come to God in weakness, repentance and faith, trusting in His Divine goodness and forgiveness through Jesus the Son, with a desire to be obedient to all He’s commanded: then we’ll get the revelation, presence and love of God: Father, Son and Holy Spirit. But what awesome PROMISES: God on the inside. “My Father will love him” Awesome. “He will be loved by My Father, I too will love him and will SHOW MYSELF to him”. WOWzer! Jesus is going to SHOW (Reveal) Himself to you. Have you had that personal REVELATION yet? It comes to EVERYONE who’s born of God’s Spirit. When you are BORN AGAIN you KNOW Jesus, because He SHOWS Himself to you. All this shows us how DEEP the Father’s LOVE for us is; and How interconnected God is: Father, Son and Holy Spirit. Have an awesome day with the RESURRECTED Lord Jesus Christ. Be filled afresh with God the Holy Spirit NOW! Be assured that you belong to Father God Almighty and He LOVES you. Amen!